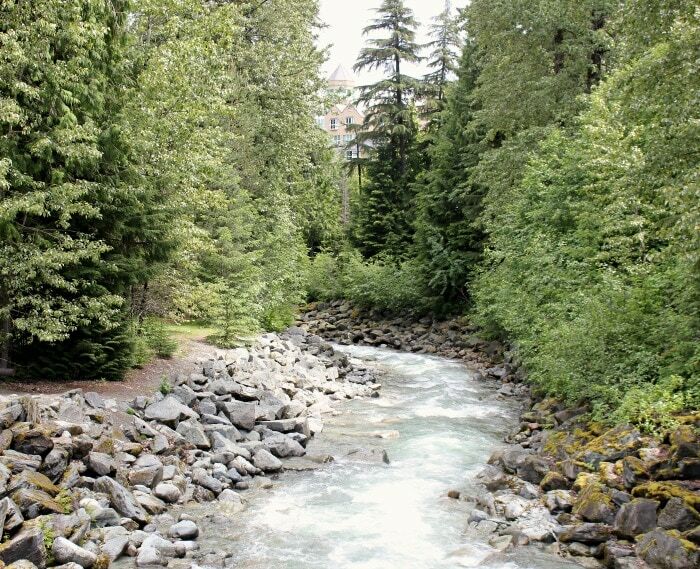 Whistler, British Columbia is a very popular resort town that is well known for its winter recreation sports. It is the largest skiable area in North America with 2 mountains, Whistler mountain and Blackcomb mountain, and over 8000 acres of skiing. The 2010 Winter Olympics were held in Vancouver, with numerous events taking place in Whistler, just an hour and a half north of Vancouver. However, many do not realize how much Whistler has to offer during the summer, spring and fall. It’s one of the rare places you can go skiing or snowboarding in the morning and then go biking, hiking or enjoying an outdoor concert in the afternoon. The spring and fall are great times to take advantage of fewer people with the wide range of activities available at Whistler from both main seasons. 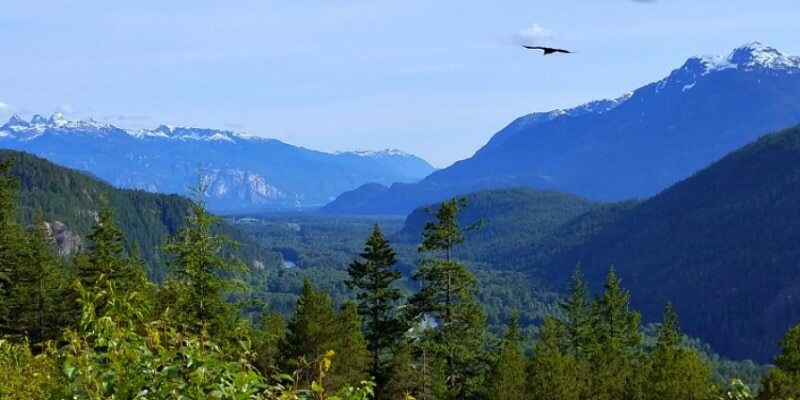 During the summer time, you’ll have warm temps for outdoor activities while also enjoying the breathtaking peaks of the Coast Mountains of British Columbia. We headed up to Whistler for Memorial Weekend for our first visit to see all that the area has to offer and we most definitely were not disappointed. In fact, my whole family is already taking about when we can visit again this year as we really felt we could spend a good week up there, checking out all the different activities that Whistler has to offer. We really felt like Whistler catered to every aspect of what you would expect from a good family vacation with a variety of lodging options whether you want to be right in town within walking distance to everything or want a little more quiet, restaurants for all different tastes & budgets, shopping in a cute, chalet-style village, easy access around town to get everywhere you want to go & such an assortment of outdoor and indoor activities to try out every day. For those in the northwest, I think that British Columbia can be overlooked destination for summer fun as most folks will head east to the mountains. As much as I love our Cascade mountains, I do feel like there aren’t as many lodging options to be able to stay right in the heart of the mountains, so I’m excited to have found a destination that offers so many unique aspects to fulfill the needs of families and one that is nestled right at the base of the Coast Mountains in British Columbia, so you get the full alpine experience. Whistler was closer than I realized as well, as it’s 4 1/2 hours from our home in the South Sound area, even closer if you’re in the Seattle area or north sound of Washington. You could spend a day or two in Vancouver visiting the big city for the sights, events, and shopping and then head to Whistler for outdoor adventures and a cozy alpine village atmosphere. I will be sharing about some of our favorite activities for families, as well as ideas for family friendly lodging & restaurants in more posts, but first I wanted to share more information and tips about visiting Whistler during the Summer or Off-Season. Easy Driving Distance from the Puget Sound area – the 4 hour drive from Seattle to Whistler is definitely doable for a long weekend getaway to visit a new, unique destination that all ages will love. There are a number of fun stops along the way to make the destination just as much of an adventure as your time in Whistler. Numerous family-friendly outdoor & indoor activities – Whistler, especially during the summer and off-season, definitely features a lot of activities towards families. There are several lakes within walking distance of Whistler where you can participate in water activities such as canoeing, swimming and more. You’ll find options for short or longer hikes close to town or exploring the mountains. You can also find adventure activities such as ziplining, riding the Peak to Peak gondola between Whistler and Blackcomb mountains, mountain biking and tree top adventures. Indoor activities include a water park, trampoline center, indoor rock climbing, First Nation cultural museum, art museum and more. 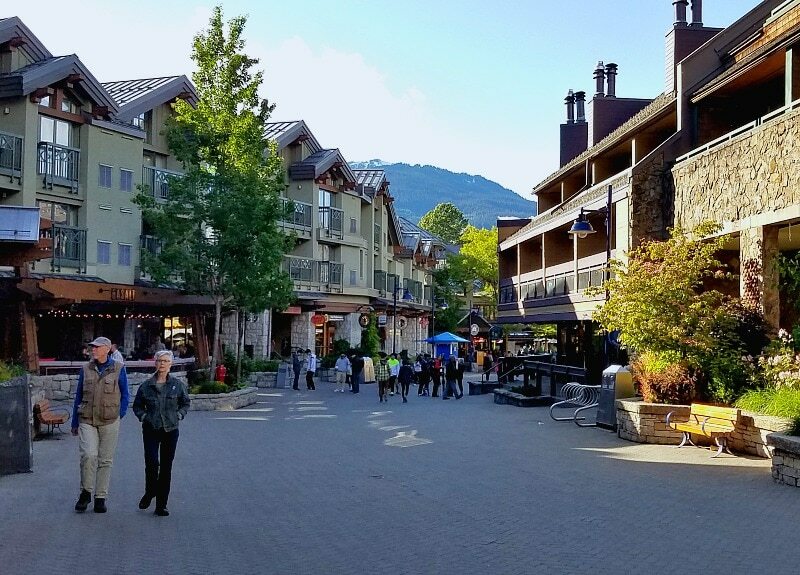 Easily Accessible Town by Walking, Bicycling or Using Public Transportation – Whistler is separated into two villages, the main village & the upper village by Blackcomb Mountain. These are connected by pathways that travel over a small creek and it’s easy to walk between these villages for shopping, dining, activities & more. There are several options for free & paid daily parking (about $5-7/day) between the two villages if you’re staying outside of the two villages (we stayed in a neighboring village called Creekside) or you can park at your hotel if staying at one of the two villages in town & then just walk everywhere. We stuck with using the daily parking lots to drive into town each day & walk around from there, but you can also use the public transportation to travel between the villages as well. 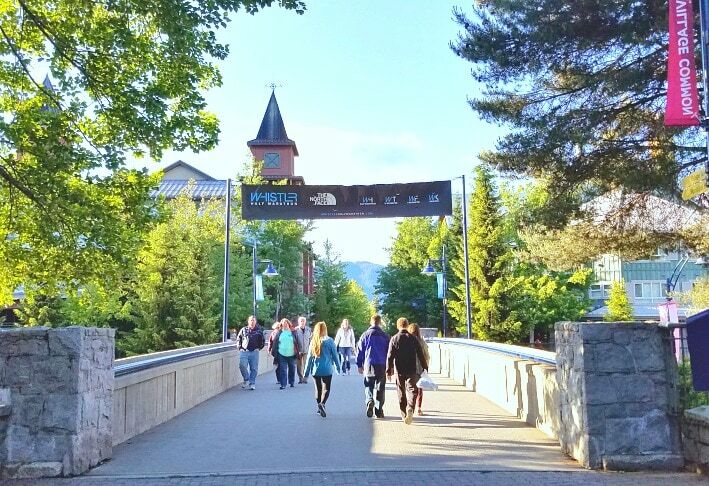 Whistler is a very bike-friendly town, too, with over 40 km of paved trails on the Valley Trail system, connecting the various towns around Whistler. We felt that Whistler was so easy to find your way around, partly due to such good street signs telling you where to go & maps you can find all over the villages, so it made for a great way to get exercise and an enjoyable stroll thru the shops & pathways connecting the two villages. Diverse Restaurants using locally sourced organic ingredients – Whistler is filled with so many unique & diverse restaurants for every cuisine. So many restaurants used locally sourced and organic ingredients and there were restaurants that foodies will love & would make great date nights if you have grandparents along to watch the kids, as well as family-friendly restaurants on a variety of budgets. Options for All – If you head to Whistler in the spring or fall, you could have the option of taking part in the winter sports as well as the summer recreation opportunities, too. You can head up to the mountains in the morning for skiing or snowboarding or just exploring the snow walls and making the most of all the gorgeous photo ops when taking the amazing Peak to Peak Gondola (the highlight of our Whistler visit) and then spend the afternoon relaxing by the outdoor pool (they’re all heated), bicycling to a neighboring lake, or ziplining thru the treetops. If you have a family with different ages from younger kids to teens, this makes Whistler an ideal spot to visit as it’s sure to have activities that any age will love. You can easily access the two mountains thru several chairlifts and gondolas, both in Whistler & Creekside, too (depending on the time of year), which will give you beautiful views of the Coast mountains & the town of Whistler nestled into the valley. If you’re interested in the winter sports, the ski season typically starts around our Thanksgiving time frame and lasts thru end of March or April for both mountains (depending on the weather). When we visited Memorial Weekend, this was actually the final weekend of the ski season for Blackcomb Mountain (Whistler mountain had closed earlier in the spring). Some of the best times to visit for more affordable times while still experiencing everything Whistler has to offer are in November and April/May. Of course, the summertime is also a prime time to visit with the warm weather , so you can take full advantage of all the outdoor activities like water sports, hiking up into the mountains, and more. However, if you want to visit the famous Peak to Peak gondola (a gondola ride that takes you from Whistler Mountain across to Blackcomb mountain), you’ll want to make sure you plan your visit around the times it will be open. There is a period of time in May and October when it is out of service as that’s a regular maintenance period (for this year, the period of time is May 21st – October 10th & then it will reopen for the winter), so make sure to check those times out on their website. I will have a full review of the Peak to Peak Gondola soon, but just trust me on this – it is a must-do activity if it’s in your budget as it’s a once in a lifetime experience to ride this gondola across the span of the two mountains, plus the fun activities and photo ops you can experience up on top of both mountains! This was definitely the highlight of our whole trip to Whistler – riding the Peak to Peak gondola! These are just a few of the fun Whistler festivals and events happening in the summertime that you might want to time your visit around to take advantage of all the activities. Canada Day and Independence Day – July 1 – 4, 2016 – this is a very popular time to visit with families as you have the benefit of two celebrations just a few days apart with Canada Day on July 1st (Canada’s Independence Day) and 4th of July for the US. On July 1st and 2nd, the Vancouver Symphony Orchestra will be providing free concerts at the Whistler Olympic Plaza right in the heart of Whistler. There will also be parades, street entertainment, crafts for kids and more special events for Canada Day. Whistler Children’s Festival – July 8-10, 2016. You’ll find everything from diverse live performers (theater, music, magic & more), hands on art workshops, street performers, special play areas for the 2 & under crowd, and many free activities for kids all weekend long. Crankworx – August 12 – 21, 2016 – Crankworx is a world-famous mountain biking festival, filled with mountain bike racing, slopestyle competitions, Kidsworx, bike demos & more. This is definitely one of the most popular festivals at Whistler in the summertime, so it will be very busy and rates most likely will be higher for accommodations. But if you have mountain biking fans in your house, this will be an event to check out! Whistler has so many indoor & outdoor activities to keep a family busy on their vacation at any time of year but the best is still to come! The Whistler Renaissance Project is underway at Whistler right now (still in the planning stages so it’s several years away from being built), but there are exciting plans for an indoor Watershed Adventure Center /Water Play center with waterslides, waves, rope swings & caves. There will also be the Blackcomb Adventure Park with six, new year-round outdoor family activities to experience up in the mountains and an Indoor action Sports complex for aspiring ski, snowboard, mountain bike, BMX & skateboard athletes. Definitely a lot of exciting plans in place for even more family fun activities at Whistler, so keep an eye on those plans as you think about future vacation possibilities. From the Puget Sound area, Whistler is not as far as many people realize as it’s just an hour and a half away from downtown Vancouver BC. If you’re driving from Seattle to Vancouver BC the distance is 2 1/2 hours. From our house in the South Sound to Whistler, it was 4 1/2 hours with typical traffic & a short border wait. We visited Whistler on Memorial Weekend, so we did face typical Seattle area traffic and 20-30 minute delays at the border crossing, so that made our trip take longer, but if you time it right, you won’t have to wait at the border long. However, I highly recommend the WSDOT app when crossing the border into Canada – this was very helpful as we debated which border to use. When you’re crossing in Blaine, headed towards Vancouver, you can either take the Peace Arch crossing or the Truck Crossing (it’s just a few miles off I-5 with clear signage to direct you there). On our way up, we found it cut the time in half to use the truck crossing when the Peace Arch got busy. It really can change by the minute, too – we stopped in Bellingham to get gas & bathroom break and it was less than 5 minutes for the border – within that 15 minute stop, it had increased to a 30 minute wait based on the app, so we were thankful that we had it to check at the last minute. The app is also helpful for dealing with Washington traffic & delays, too. A great rest break would be to stop at the Historic Stewart Farm in Surrey, BC, too, just about 10 minutes from the border & on your way to Whistler. Make sure to check out our review about this family-friendly location to visit. Once you pass by Vancouver (we drove around Vancouver to the East & then north of the city), you will then reach the Sea to Sky highway which takes you from the city up to the mountains. If you’re traveling in the winter, you will need snow tires from October 1st – March 31st. Once you pass by Vancouver (we drove around Vancouver to the East & then north of the city), you will then reach Highway 99, better known as the Sea to Sky highway which takes you from the city up to the mountains. If you’re traveling in the winter, you will need snow tires from October 1st – March 31st. This highway a destination in itself as there are so many cool stops along the way that you’ll want to plan for if you have the time. You’ll find everything from amazing vistas of the mountains, islands and Horseshoe Bay (breathtaking at sunset), a mine museum, spectacular waterfalls, gondola ride & more. You could really spend a day just exploring all of the stops along this highway. 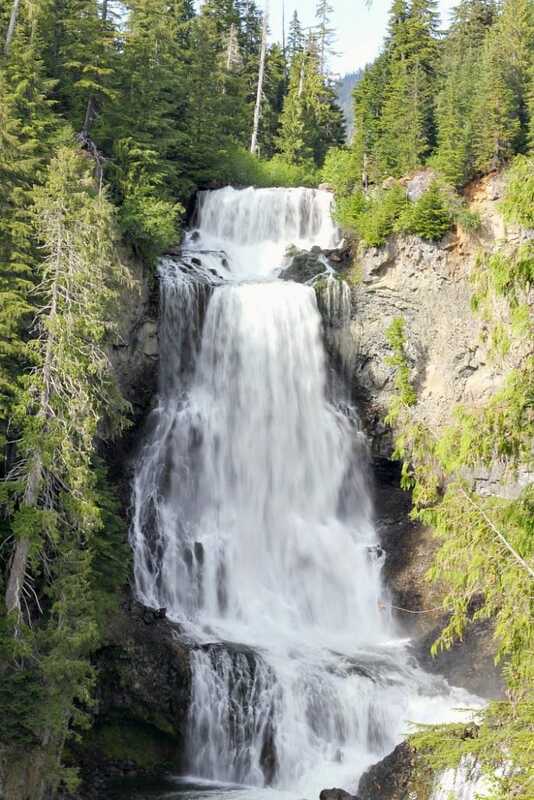 Check out all of the many waterfalls in the area around Whistler and the Sea to Sky highway. Alexander Falls – this is not right off the freeway but about 7 miles up the road. However, about a half mile before the falls, we found a black bear eating right on the side of the road. The road has signs all around that say it’s a very popular spot for bear viewing and they were right (just make sure to not stop right next to the bear and give it plenty of space so they don’t become comfortable around people). Alexander Falls is also just before the Olympic Park. You don’t have to do any hiking to access the falls, you just park & there is a platform right next to the parking lot with perfect viewing of the falls, so it’s a nice one to drive to, take a few pictures & then continue on your drive. Whistler Olympic Park – we didn’t get a chance to visit as it was closed when we arrived, but it looks like a cool place to check out some of the Olympic history that was made here in 2010 as 1/3 of all the medals in the 2010 Winter Olympics were awarded here. This park hosted the ski jumping, cross-country skiing, biathalong, & nordic combined events. 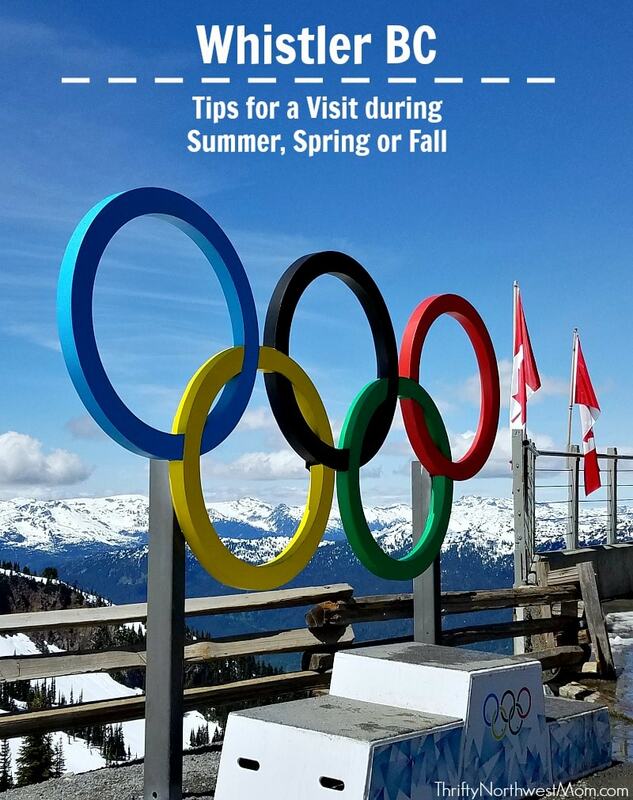 There are a lot of events for families in the winter (sledding, snowshoeing, cross-country skiing, to name a few) as well as a pretty place to explore in the summer & see where Olympic history was made. Brandywine Falls -this is located within a Provincial Park, so there are plenty of other trails, as well as the 10-20 minute trail to the viewpoint of these pretty falls. Brittania Mine Museum – visit the site of a working mine & take an underground train deep into the heart of the mine. You’ll even have a chance to pan for gold. Identification for Canada – You will need either a Passport or an Enhanced Driver’s License. If you have a passport, that’s great, bring it along. But no worries if you don’t have a passport – you can just use an Enhanced Driver’s License which you can get at the DMV. If you already have a Driver’s License, you will just pay $3/year until your driver’s license is renewed to update it. Kids Identification for Canada – Kids will need their birth certificate. At this time, Canada does not require passports but your kids will need their birth certificate, so make sure to bring that along with you to show at Customs at the Border Crossing both going into Canada & entering the US from Canada. Have you visited Whistler BC? What were your favorite family-friendly tips for visiting Whistler? Stay tuned for more Whistler posts about family-friendly activities, restaurants, lodging & more!